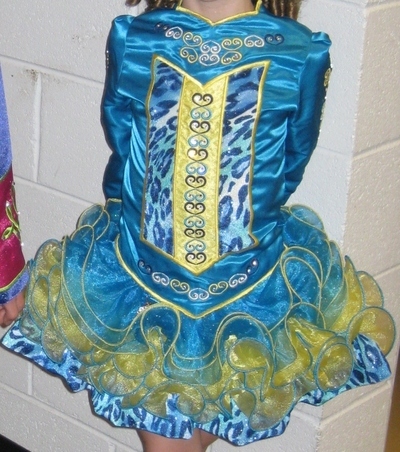 Playful turquoise and yellow satin custom made dress with animal print accents. Bow style cape. Dress is 18 months old, worn for only 9 months. Crystals and sparkles in the animal print make this dress shine on stage. Two pair matching kickpants, matching headband and matching scrunchee (great for bun style wigs!) Dress priced for quick sale! 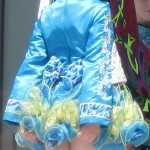 An extra ruffle has been added to the skirt which can easily be removed to shorten. Room to let out and room to let down sleeves. Asking Price: $US300. Shipping costs are included for my own country, overseas shipping is extra. Sale is final.